Shares come with a variety of spray-free veggies, herbs, & fruit each week. Shares feeds 2-4 people. You will also receive weekly e-mails with veggie list & recipes. 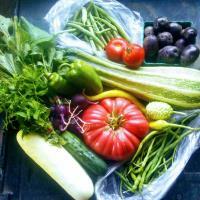 3 CSA Perks For Members: Special CSA Farm Day on July 6th. An extra value share thanksgiving week. Building a relationship with your farmer & food Please email us to setup other payment options such as e transfers or cheque.